Cold at first, but mild and mostly sunny all day. There were only a few light showers overnight and I got up in the 6:30am pre-dawn gloom to mostly clear skies. Overhead I could hear the whisper of a high-flying jet, most likely on the Sydney-Melbourne route and imagined the bleary-eyed occupants, having woken to a 4:00am alarm for a 4:30am car to the airport and a 6am flight. A few of the occupants might be looking out of the window at the forests and mountains below, as I have done on many commuter flights in various parts of the world, wondering who's down there and what are they doing? I know where I would rather be. Knowing that I had another easy day, I took my time breakfasting and packing up, and started walking around 9am. 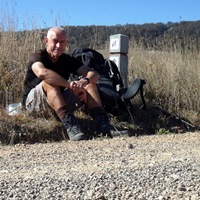 The guide-book warned that the next 8km was mostly uphill, but it was a very gradual climb, not onerous at all, along the beautiful sun-dappled track through the eucalypt forest. After an hour, the sun was warm enough to strip down to my T-shirt and I felt fortunate to have missed most of the rain that had passed through NSW and was now apparently falling on Sydney and the Central Coast. Around 11am I reached Norths Lookout, a broad rocky outcrop that gave fantastic views in a 180° arc from the NE through NW to SW and I stopped for a short while to enjoy the scene. I then continued on for another half hour to the edge of the Woomargama National Park and had lunch in the sun in a broad clearing. Very pleasant. From there, the trail passed through a pine plantation and, at one point, I briefly passed through a "No Entry" area where I could hear ongoing logging operations, but had no problems. After the pine plantation the trail again entered eucalypt forest. I was making good time and it looked like another very early finish. With just a few minutes to go, I reached a track junction where I needed to turn off to get to the campsite when I heard a vehicle approaching. It stopped and turned out to be Warwick, the trail coordinator, who had some business in the area and guessed I might be nearby. It was nice to see him again and we chatted for quite a long time about the Track and the ultra-distance trail race which is now held on a section of it each year. After saying our goodbyes I hiked the last half kilometre to the campsite which was on a lightly forested knoll that would get the sun late and early. As I set up camp, an elderly couple (well, older than me!) driving a 4WD with a camper trailer arrived. I was glad I hadn't arrived any later because I suspect they would have set up near the shelter which I had claimed as my own. Instead, they set up 50 metres away and were quite sociable, and we chatted for a while about the Hume & Hovell expedition. After setting up camp and washing, I updated my diary before another early dinner and night. I am booked into a cabin tomorrow night but, despite being another shortish day, there will be some tough trail to negotiate en route.